A standalone Ne 2 board (i.e. 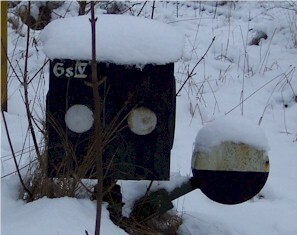 a distant signal post plate). 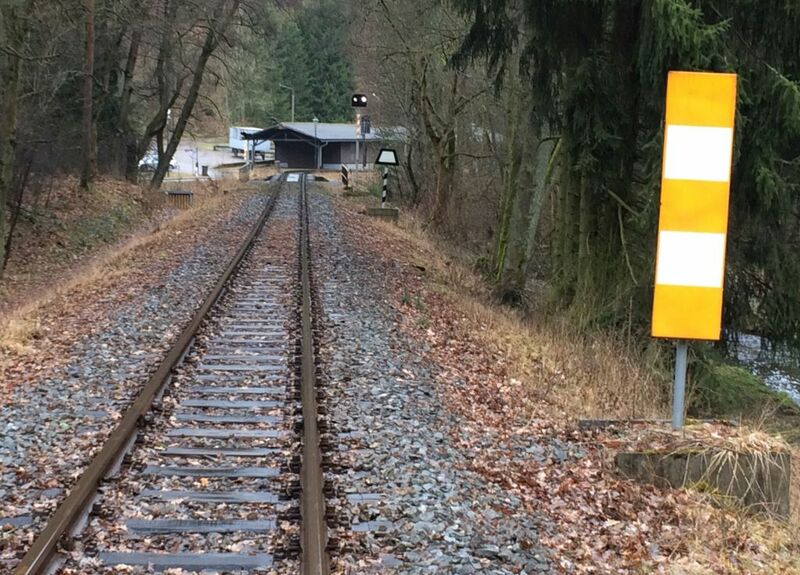 The H-board instructs a halting train to stop here. 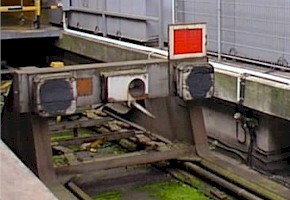 This picture was taken at Hamburg-Dammtor track 1 (S-Bahn), and since the signals are placed to the left of the track, they are meant for wrong track operation. 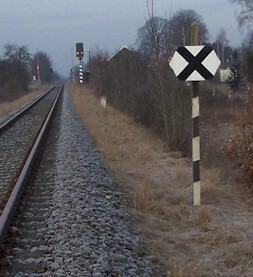 Should in a rare event a train be required to use the left line towards Hamburg Hbf, there is no colour light signal, but the standalone distant signal post plate tells the driver that he is approaching a main signal which may show stop and hence drive at appropriate speed. 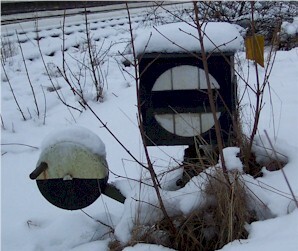 The signal device of a derailer, showing aspect Sh 0 (a line-close signal). The standard position for this derailer is "derailer on, line closed" as you can see by the black part of the operating lever facing down (standard position is black downwards: "dirt facing dirt"). 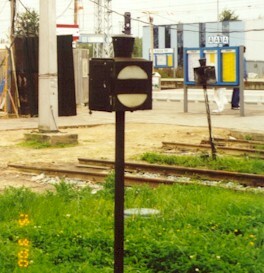 The rear of the same signal. One could suspect that driving beyond is not advisable, but to make sure DBAG puts an Sh 0: stop-no passing signal onto every buffer. 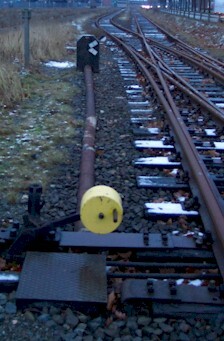 An Sh 0 marks the end of track in Rostock Hbf. At dead entry routes instead of an Sh 0 an Sh 2 board is placed. 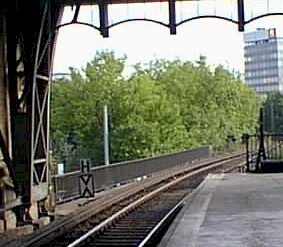 This is a track at Hamburg-Altona. This is a point signal for a manually operated point. 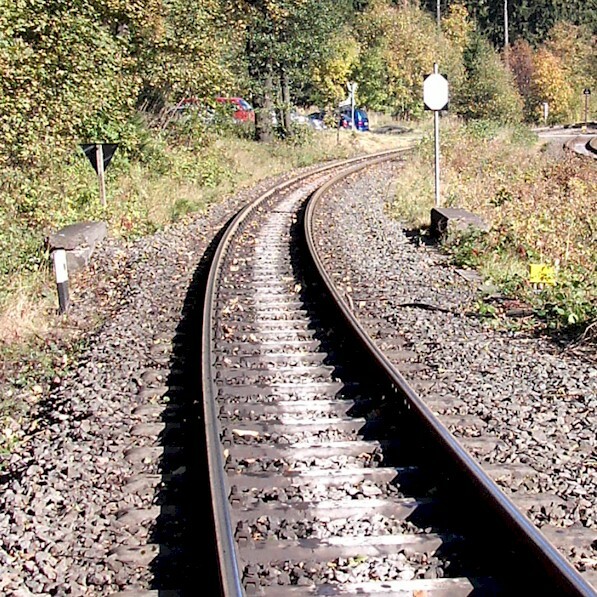 The point is currently set to straight and for the curved track the box would turn about 90� clockwise. As the black part of the lever weight is facing downwards, this points are set to their standard position. See also light points signal. So 17 Ankündigungsbake (Announcement board) for So 18 signal. A signal for double-slip points. The yellow lever weight tells us that there is no "default" position. 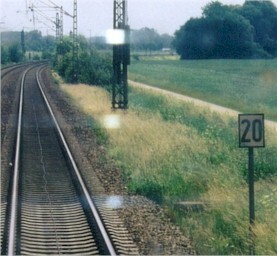 A DB Lf 7: From here on, the maximum speed is 200 km/h. Note that this is a special case: Usually, only the begin of a speed restriction is signalled, so you are unlikely to see a 200 km/h signal. This one is on the Augsburg-Donauwörth line which is equipped with the experimental Sk signalling system (see there). One of its properties is that every speed change is signalled: this sign here is really an end of speed limit - resume 200 km/h line speed signal. A DR Lf 4 (permanent speed restriction warning board) giving advance notice of a speed restriction of 50 km/h. A DR Ra 11a waiting sign (DB: Ra 11) with a Kreisscheibe at Rostock Hbf. The number plate 4II tells us that for waiting signs the same numbering scheme as for line-close signals is used. Begin of announced speed limit.